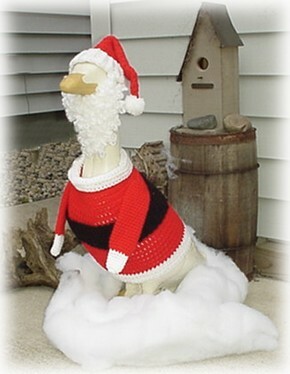 This festive crocheted Santa pattern is perfect to dress a decorative lawn goose for the Christmas season. 3-38: ch 1, repeat row 2, sl st row 1 and row 38 tog. Hat: red, start at joining seam of hat1 sl st in the end of the first row, you will be working along the edge. 1: 1 sc in end of each row, 38 sts, join with a sl stin first st.
13: ch 2, ( 2 hdc tog, 1 hdc in sts ) 4 times, 2 hdc tog, 1 hdc in 1 st.
23: ch 2,( 2 tog,) 4 times, 1 hdc in last st.
25: ch 2,( 2 hdc tog,) 2 times, 1 hdc in last st. fasten off. TASSEL: wrap yarn around 4 fingers 50 times or a 3 in piece of cardboard, slide off, tie tightly in center, trim the edge and fluff, sew or tie onto top of hat. 93: 1 sc in 3 sts, 1 hdc in 3 sts, 1 dc in 3 sts, sl st the ends of row 1 & 93 together, fasten off. 1: 1 hdc in same space and in each st, join with a sl st in the first st.
2-5: ch 2, 1 hdc in each st, join fasten off. 4: ch 3, 1 dc in each st, join. 3-7: 1 sc in each st.
32: 2 sc tog 8 times, sl st in 1 st, fasten off. Position the sleeve on the coat and sew into place or use a brass paper fastener to hold in place, this allows you to move the arms up and down. The motto at Sue’s Crochet is “Don’t let the Neighbors see your Goose Naked!” At Sue’s Crochet Pattern Collection, you can choose from 34 reasonably priced original crochet pattern for lawn geese, like those shown here – and make sure your goose is dressed well for every season.